I love these WI posts - the more time I spend up there the more I appreciate spending 1/2 my time in our neighbors to the north...definitely a few spots on this list i need to try! Anyone know what Wedl's season is? It was on my summer bucket list, and it just didn't happen. I've had today's featured stop on my list for a few years now and a recent trip with swside to the Tri-State area (WI, IA, IL) meant it's time was coming. The unincorporated town of New Diggings, ones of the states oldest, sits about 30 miles east of Dubuque. There's only two businesses and they're both bars. Wisco has it's priorities. 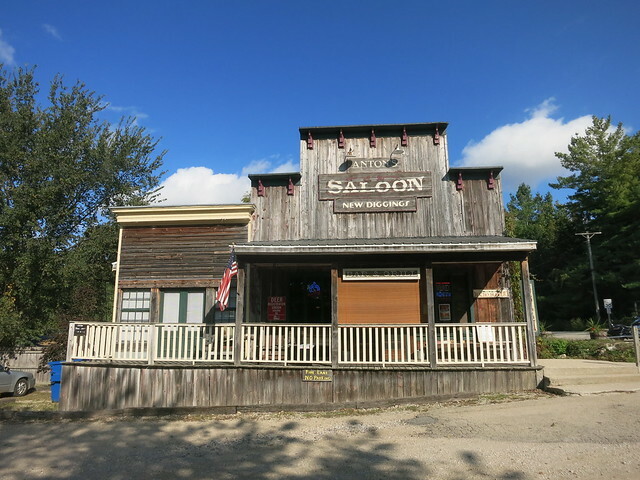 Sitting on one side of the road is the New Diggings General Store and Inn who's structure was built in 1844 and on the other side of the street is Anton's Saloon, which was made from an old school barn dating back to the late 1800's. Both are big with bikers which there's certainly no shortage of when it comes to the land where Harley Davidson was born. 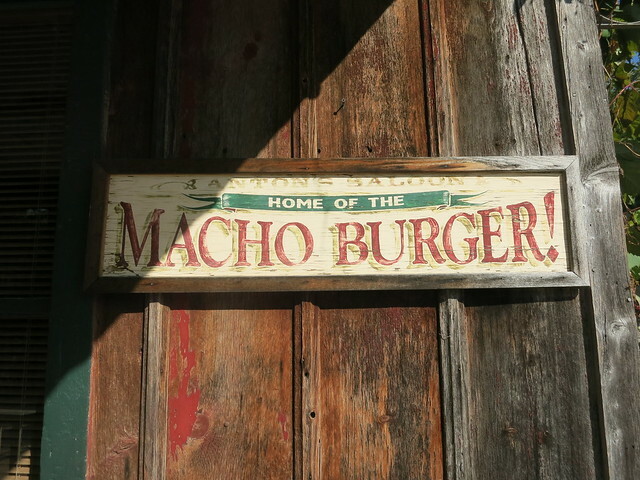 Both stops are also known for a particular food item and at Anton's Saloon, pictured up above, the signature dish is the Macho Burger. 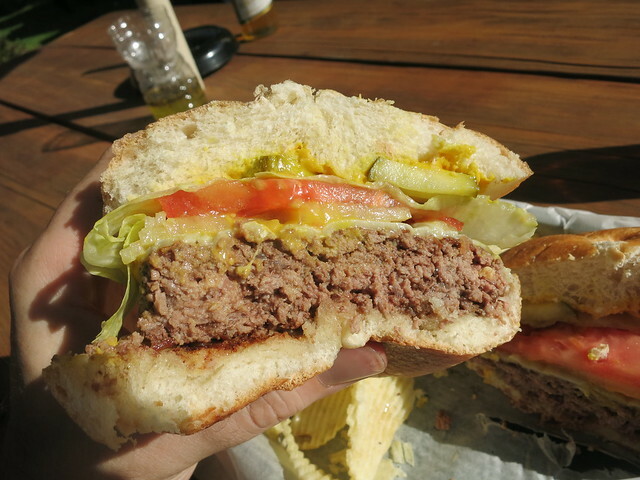 This is a 1/2 lb hand patted burger made with freshly ground beef from the nearby Weber Meats in Cuba City, which we visited before making our way here, great stop. It would be real easy to just buy some frozen puck patties and throw them on a grill when a hungry biker there for beer comes calling but this is Wisconsin and that's just not how it's done. On this particular Saturday afternoon visit it was a beautiful day and bikers were out. However none of them we're inside as Anton's has a really large outside deck that walks down into a yard with plenty of tables to take in the sun. Everyone was outside but as always I wanted to take a seat at the bar first to mingle with the people behind it. We ended up chatting with the owner who moved to the area from Aurora. I think they said they bought the place over 20 years ago. It looks much older than it is as they had an entire barn taken down and then restored on the ground where it sits today. Plenty of room inside both at the bar and off in the pool table room which sits in it's own walled off area. The urinal in the mens room was a Trough ala Wrigley Field. Everything inside was from another time with the exception of the TV's which we watched some college football on while waiting for the burger to made. The friendly owners husband was cooking up the food for me and a few others while she was pouring beers for everyone. No hard liquor in this town, not sure they want it due to the fact most everyone stopping in is riding a bike or at least driving as there's only 20 or so people that live there. Judging from some of the stories next door it can get pretty wild at any given time, when the weathers nice anyway. After a couple ice cold Spotted Cow's the burger was just about ready which meant it was time to take the party outside as I love my natural sunlight, more so for the picture, haha. As is often the case I was near sure this was a winner before a bite was made. They don't ask you how you want it cooked so it does come out medium but don't let that fool you when it comes to the juiciness of this one. It had to be eaten like an Italian beef there was so much meat juice squeezing out. While seasoning was minimum I was fine with that because the taste of the meat along with the raw onion, lettuce, tomato, pickles, and cheese were the exact flavors that made me fall in love with burgers to begin with as this is how my mom would make them. 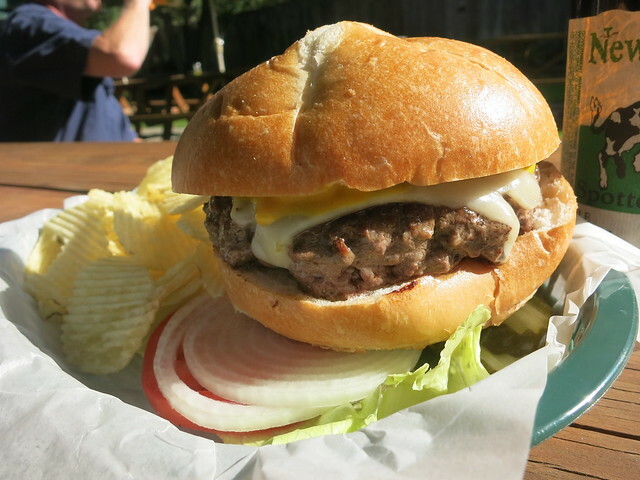 A near perfect backyard burger. David Ross, owner of Dr Dawg is a proud graduate of Hot Dog University. Had the pleasure of visiting th Anchor Bar in Superior Wi last week.it is everything that other people had written about.Burger was 5 star..the bar itself was a dive bar in the best sense of the word.Not a easy place to find but well worth it. 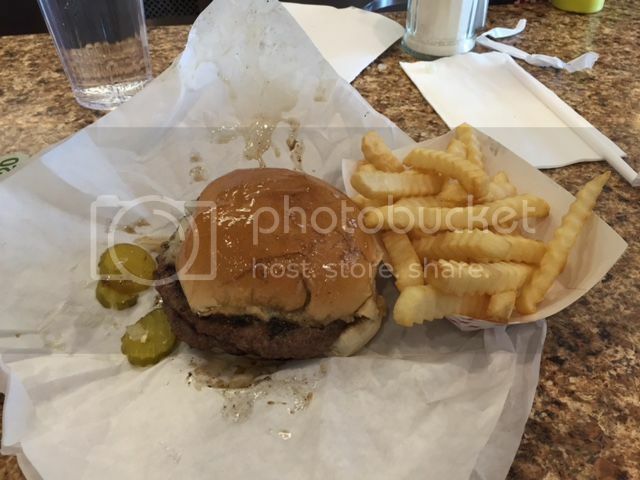 I had a fantastic burger at Grill Junkies in Oconomowoc. They offer a 1/3, 1/2 and then a jumbo size burger. 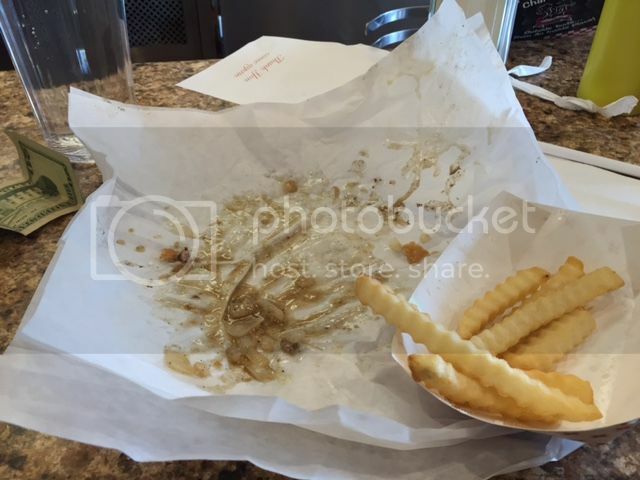 The fries were beer battered (I usually hate battered fries) and surprisingly good. And they have a little condiment bar so you can top with whatever you like. Not sure I'd call it a destination, it's in a strip mall, but it was really tasty. I had heard good things also. Brought some neighbors on a road trip last Saturday to Fred's in Burlington. Still at the top of their game. Half pound griddled burger and great spuds. Burger No. 65 comes from a place I recently posted about in a Milwaukee thread. In short summary one of the guys behind Longman & Eagle here in Chicago moved out to Milwaukee with his wife and opened a bar specializing in creative housemade sausages as well as draft cocktails. It's a relaxed kicked back atmosphere in the hip Bay View neighborhood. If you read the review in the other thread than you know I'm a fan. The menu is mostly dominated by encased meats but they also have a burger. It's a somewhat recent addition that, like many other masterpieces, was created by getting use out of everything in the kitchen. When the sausage is stuffed some of them burst and the ground meat from them goes into the making of Thee Dirty Burger. The beauty of it is the patty consists of a little bit of everything. It's dressed similar to an In 'n Out Burger. There's also real chopped bacon bits scattered in and the use of their housemade Velveeta style cheese. Go on. Git! It's quite a treat and something worth ordering on a menu with many interesting options to choose from. First time poster, just wanted to say I enjoy the content and will try and add a little to the mix whenever possible. 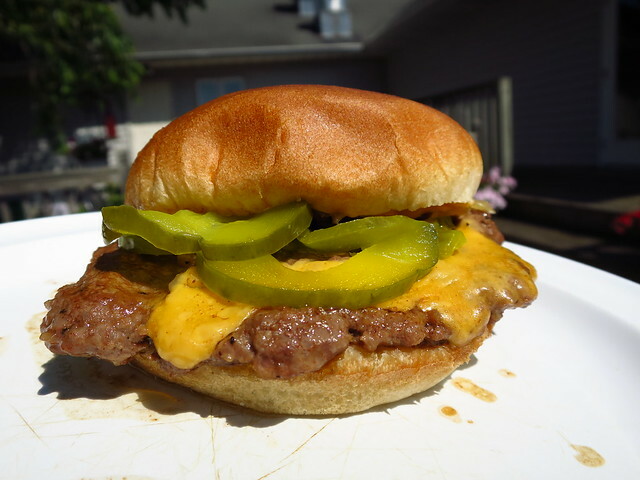 Great thread on WI burgers, there are so many good ones to try. 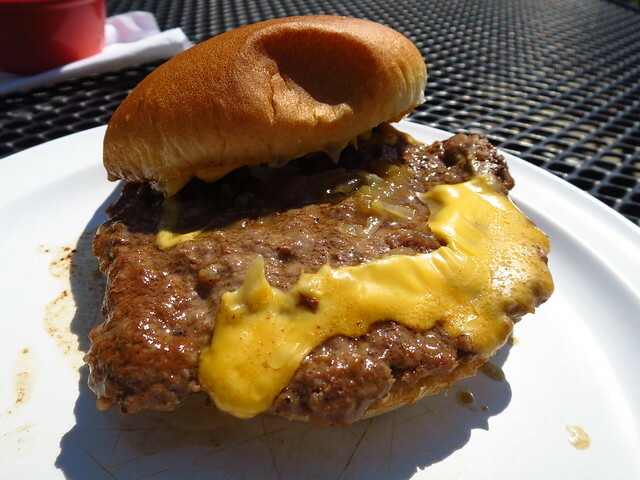 I've tried a lot of the butter burger spots listed here (Kopp's, Charcoal Inn South, Bud Willman's, Kroll's), and really love that style of burger with the hard roll, charcoal grilled flavor and butter. If anybody is around Manitowoc (home of Bud Willman's) again, Late's serves a very good butter burger, and their cheese curds are terrific. I'm heading up to the UP over Memorial Day Weekend, and usually alternate between driving north through Milwaukee or Madison. The 94 to 43 route along the lake is ripe for a butter burger tour, but I haven't had as much luck going through central WI. Does anyone have a good non-Culver's butter burger rec if you are taking 90 through Madison to 51? A friend and I took a driving tour around Lake Winnebago yesterday stopping at Mihm's for lunch. Went to Menasha by I-41 and after we needed gas with the nearest BP on the Manitowoc Road. Since we were already east of Mensha, old habits kicked in and i just headed East eventually picking up 57 towards Elkhart Lake. Decades ago my standard route to Road America from Neenah Wisconsin was down to Fond Du Lac and over on 23, coming home by way of Chilton, effectively circumnavigating Lake Winnebago. I easily retraced the route without the aid of maps or NAV. Very scenic and nice drive much as I remembered the countryside, many years ago. Nothing has changed at Mihm's since my last lunch three years ago. I enquired of the present owners and was told they were rarely or never in the Restaurant. A Little disturing for the long run but business was brisk. This time I had a double steak with fries. Skip the fries, while hot, not anything special. The double steak with chopped raw onions, pickles and brown mustard was again extraordinary. I have come to the conclusion that for me a good burger or steak must have five attributes. First, good quality meat preferably ground locally. Second, charcoal cooking, there simply is no substitute. Third, a hard crusty bun. Fourth, family run, no chain operation. Fifth, butter, swimming in it, Wisconsin of course. Sixth, located in Wisconsin, is nice but not mandatory. My next tour will be after I attend this year's Packer's Shareholder's Meeting at Lambeau. I am going to start at Kroll's next to the Stadium, then Mihm's, onto Chester's in Plymouth and am looking for suggestions for other places along the route. There are two that I would definitely try to wedge in. Joe Rouer's in Duvall (just off 57 on Hwy X as you travel from GB to SB). Then Gosse's in Sheyboygan is great. Have Cheeseburger? Will travel. I used a trip to Madison as an excuse to cross another one off my list. 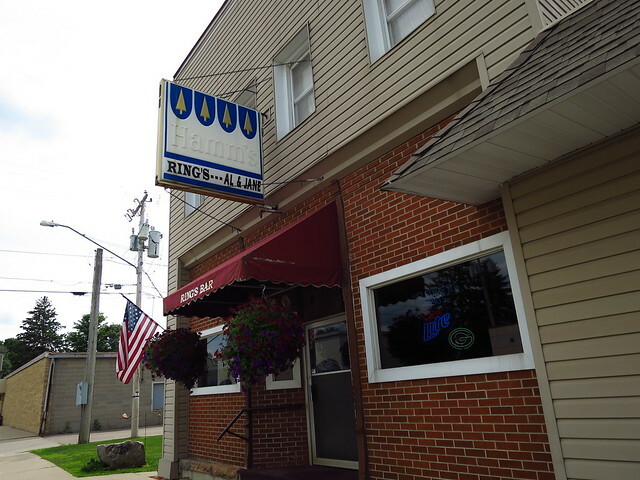 Ring's Bar in the tiny town of Plain (Pop. 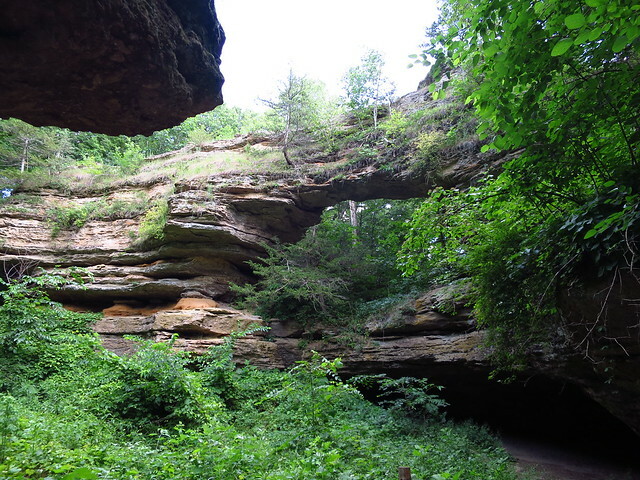 792) is about an hour northwest of Madison and just 18 minutes from Natural Bridge State Park. Daytrip! This place totally evaded me while I was in school at Madison otherwise I would've been there as me and my peops were always down for a fun daytrip when the weather was nice. 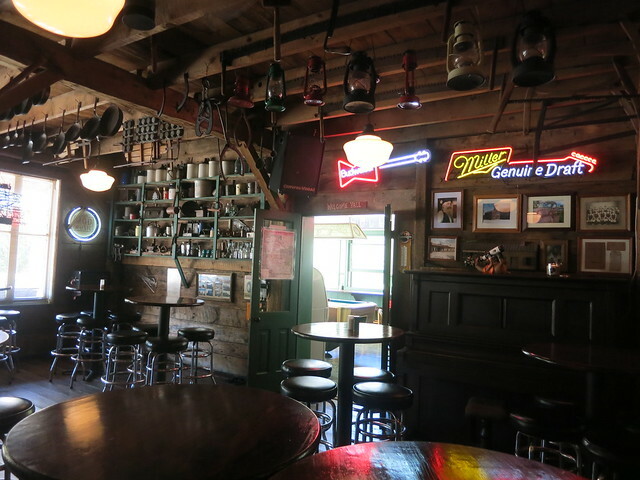 Ring's is a prototypical Wisconsin tavern with the exception of one thing. There is no visible grill at the end of the bar and nope no kitchen in back. 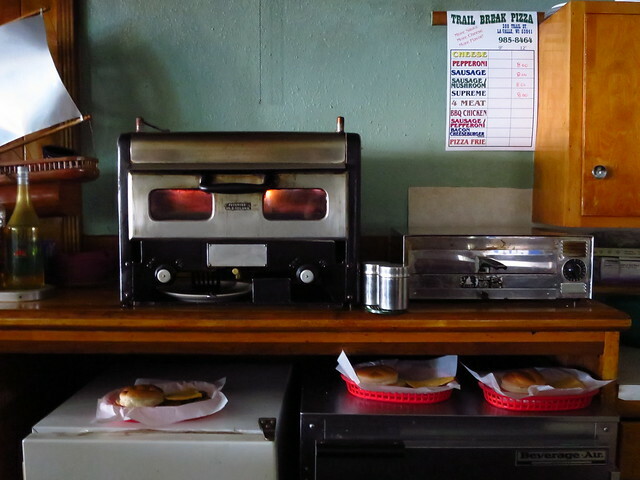 The reason this place has it's tiny cult following are the cheeseburgers cooked in an 80+ year old broilator-like machine while the buns are toasted in an old school bun browner sitting next to it. No fries, chips. The beef comes fresh from a 60+ year old butcher, Straka Meats, which is directly across the street. Local hand sliced cheddar is one of a few cheese options and it works great. Despite this burger being cooked to a nice medium doneness it was still one of the juiciest/drippiest I can remember. 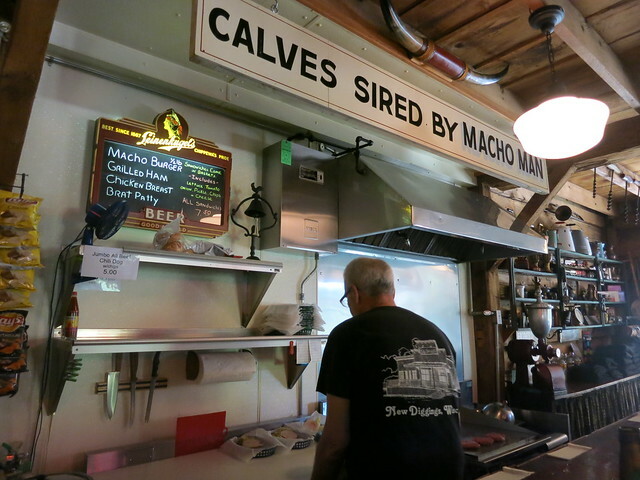 Much more so than Paul's in Dubuque which is also using an old time burger cooking machine. I waited a long time to try Ring's and I'm glad I didn't forget or lose interest because the end product is one of the best burgers in Wisconsin and thus a contender on a national level. This made for a great lunch after a trek thru Natural Bridge State Park which isn't all that big but something worth spending an hour or two of your time exploring. This area in general, despite having lots of farm land, is very scenic in the summer and a great place to bike with the hills and all. Ring's also makes for a great 1-2 punch with the aforementioned Straka Meats across the street. They're making some fantastic thick sliced bacon and big in flavor brats both of which were enjoyed over the Fourth. Stay tuned, more to come. Been to a handful of spots I'd been wanting to check out but none came with more anticipation than Joe Rouer's up in Kewaunee County which borders Door County. So if you're heading up to that area for vacation time you may want to consider a detour for burger time. The address says Luxemburg but that's probably because it's the closest town to the unincorporated community of Duvall. 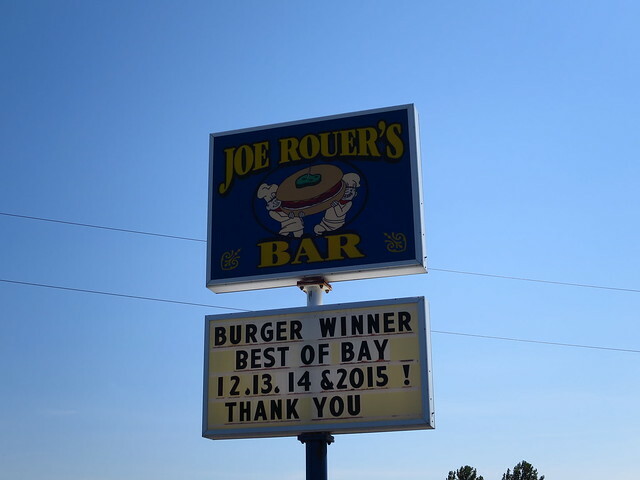 Joe Rouer's is a prototypical Wisconsin tavern. Curved bar with a few tables and than another area off of that with some games such as pool and FoosHockey. There's also a nice seating area outside in the back that borders a few farms. As you can read in the sign this is a popular burger spot in these parts and that's because there's nothing else like them. They opened in 1952 and still cook the burgers in a pan of their own grease which is also used to make the onion juice. The latter of which is a must. Without those onions this is a different animal. One that's just not as luscious. Together with some melted cheese this is one of the most glorious burgers I've ever had. The ultimate bar burger. The type that's caused serious craves for a few generations of people from these parts. 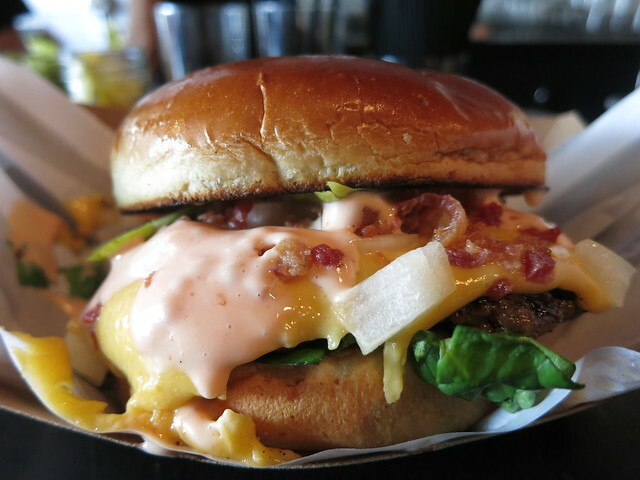 This is one of those burgers that if you want to try you need to go here because nobody else makes them this way. Once you've had one it becomes easily identifiable in a blind taste test. It's served with a small bowl of pickles which is really all you need. Maybe some mustard but that's it. You dont want to disguise that sweet, succulent onion juice. One of the best anywhere. Over and Out. Good to see da Beef made it to one of those hidden gems (except for Green Bay people). Back in the 80's it was actually a house with a bar in it. They only served those beauties with raw or grilled onions. I think they made them in cast iron in their own kitchen. No fries, brats, etc.... only those burgers. My first visit was in 1980. There were 4 of us and they served 8 burgers to us on a platter. Bottle of Miller High Life was fifty cents and the cheeseburger was ninety five cents. Still good today as then. That place burned down and the one you went to was the re-build. Now they have a bit more on the menu, but I think needlessly. Glad you enjoyed. I go whenever I am up that way. Worth a detour. I know there has been talk of it in this thread, but has anyone ever created a Google Map of each of these places? If there isn't one started, I may get one going later this week when I should have some free time. ziggy wrote: I know there has been talk of it in this thread, but has anyone ever created a Google Map of each of these places? If there isn't one started, I may get one going later this week when I should have some free time. OK, got a few minutes at work earlier so I started this up and I just finished it after eating dinner (which was unfortunately not a burger). Incredibly cool!!! Thank you for putting in the time and effort. LTH owes you a debt of gratitude. First off a BIG thanks to Ziggy for putting that map together. Some how I missed that when originally posted. Very cool and very useful. Well here's another one to add to the guide. Frankie's is a local watering hole popular for not just their booze but also their massive burgers. They easily feed two though in these parts some people can easily eat two. The burger portion of the menu boasts a tradtional cheeseburger and also a couple of house creations. I shared a Frankie Burger with my cousin on our visit and it was bigger than I thought it was going to be. It basically took up an entire entree plate and came with a knife in case anyone wants to eat it like a pizza. The burgers are only 12 ounces of fresh angus beef but it's a wide patty on a large hard roll and in the case of the Frankie Burger it comes with alot of toppings. 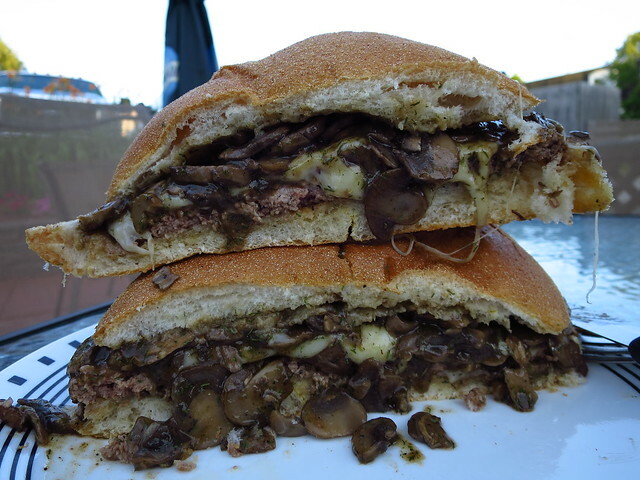 This was smothered with melted Swiss cheese mixed with some well placed Italian seasoning and piled high with sauteed mushrooms. All of that was drenched in beef gravy. The hard rolls being the sturdy buns they are held all of this together just fine. While it tasted more like a Sunday night Pot Roast dinner than a burger I thought my half was worth the calories consumed. Da Beef wrote: They easily feed two though in these parts some people can easily eat two. Da Beef wrote: First off a BIG thanks to Ziggy for putting that map together. Some how I missed that when originally posted. Very cool and very useful. Well here's another one to add to the guide. Hey man, I did the easy part. Thank YOU. Milwaukee continues to crank out good food. Seems like there's new spots open each time I'm up there. 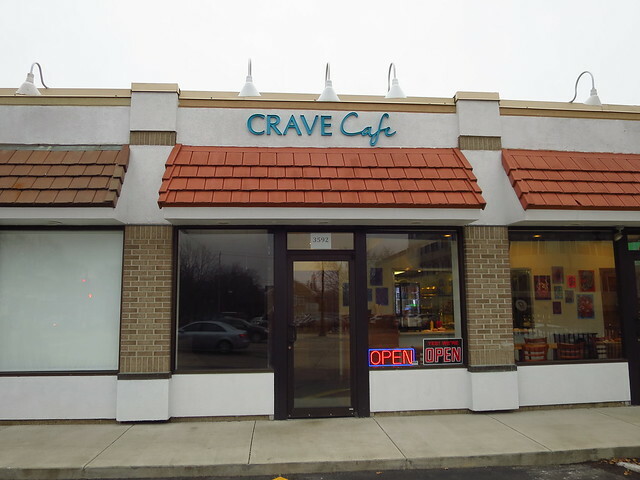 One of them, a burger spot called Crave Cafe, caught my eye. 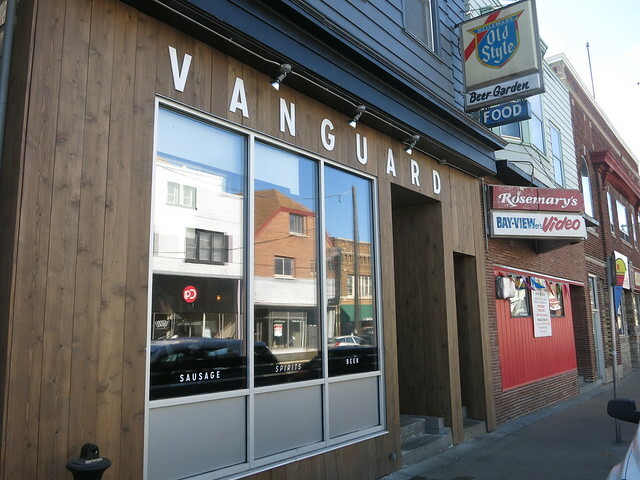 Located up North in Shorewood this place opened sometime late last year and did so to some friendly pub. I saw an article about the burgers and made note for the next time I was in town. I made it in last month and while all eleven burgers on offer (each 1/3 lb) were tempting it was the Korean BBQ Burger ($7) that caught my eye. Served with a Korean-style barbecue glaze, seasoned mayonnaise, American cheese, slaw and spicy kimchi this is the owners ode to his time in LA. 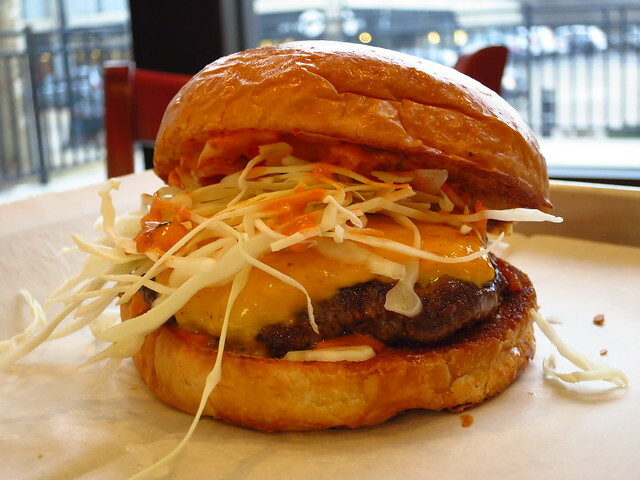 I love the combo of salty American cheese and fiery kimchi so of course I loved this burger. Great thread, but I'm noticing a lack of choices on route 41 between Milwaukee and Ripon. Any hidden gems on or near that path? We travel up to Green Lake quite often over the summer and are always looking for new places to try. If you go by way of 33 to Beaver Dam, Chili John's makes good pancake stacks in the morning and burger's for lunch. We have been eating there for 40 years while hunting. John has passed but his son, Chris, now runs the place. budrichard wrote: If you go by way of 33 to Beaver Dam, Chili John's makes good pancake stacks in the morning and burger's for lunch. Looks good, but not on the way between Milwaukee and Green Lake. Looks like a good halfway stop between Madison and Green Lake though so will keep it in mind if I'm ever doing that jaunt. Hwy 33 off Hwy 41 gets you to Beaver Dam then follow 33 to Hwy 73 to Green Lake. I go up to Berlin every so often and take that route back to go thru Beaver Dam and stop at Chili John's. My husband wants to buy some kind of rural property in WI and it would sway me if there were a town nearby that had appealing food offerings. My husband is willing to drive to Watertown and look around there since you know, LTH has a thread on the place. Are there other small towns within a couple of hours of Chicago that we ought to consider besides Watertown? There are many small towns in SE Wisconsin within two hours of most of Chicago depending on time of day and which Expressway/Tollway you travel. Sometimes depending on Traffic, you just can't get somewhere, at least that's my opinion going to Chicago! And sometimes I have a really hard time getting home. Since Chicago and Northern Illinois was the Service Territory of my employer, I know every back road that can be used to avoid Traffic. 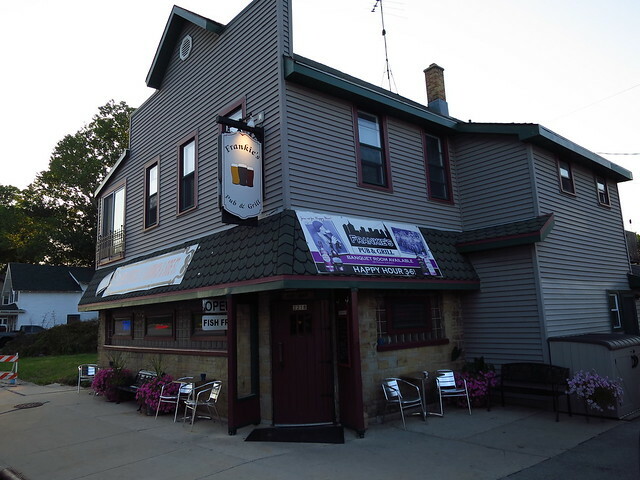 We have lived in the Town of Somers Wisconsin for over 30 years and have owned a couple of places in even more rural Wisconsin, there also is a Village of Somers now! Don't ask why, zoning I guess. When we lived near New Munster, not too far from Fred's, there was only one place to eat, Marinos, luckily it was very good but not Charlie Trotter's! There was no Fred's and now there is no Marinos. We now live on a nice Dead End road. Across the road from us is farmland, mostly in soy beans and corn. But the best place to eat near us is in Down Town Kenosha, Mangia, owned by Tony Mantuano for many years now. Our good friend, Tony's sister is the Manager. We also go to Well's in Racine another LTH GNR. That's about it and you won't find much difference between any of the other small Towns and thier proximity to good restaurants. I end up spending most of my shopping time between Woodman's, Fresh Farms on Touhy and H-Mart. 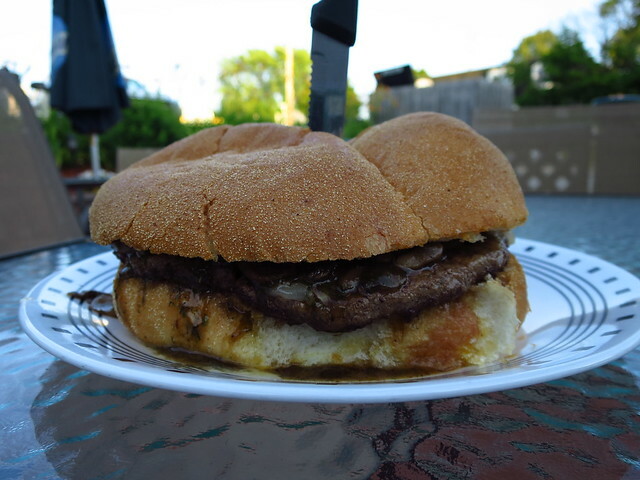 I'm fortunate to live in Racine because of some of the best griddled double cheeseburgers: Kewpee's in Racine, The Spot Drive-In, Big Star Drive-In, and Interstate Dogs in Kenosha. No need to travel to Chicago to The Red Hot Ranch on Ashland or Western, which also serve some fabulous griddled double cheeseburgers with fresh cut fries. 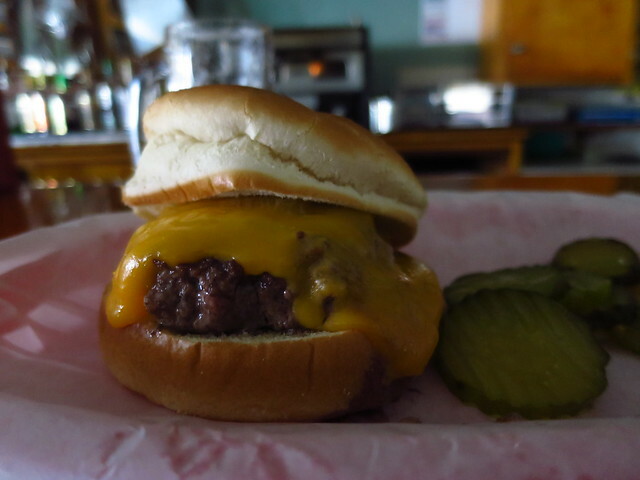 If I want to replicate a Spot or Big Star burger, a trip to Brossman's will work. If I desire a Kewpee clone, R&S Specialty Foods is only minutes from my home. Guess I'm just spoiled!